Do you find yourself having difficulty in finding a good quality bed for your large breed dog? Many pet parents do. Not all large dog beds are made the same. The Big Barker Dog Bed Review will share with you one of the best large dog beds your money can buy. Dog parents of large dogs have problems in trying to find a dog bed that not only provides comfort but, also will last through his growing stages and hold up to his weight gain. Larger dogs develop health issues like sore muscles, aching joints, and even arthritis as they age. The Big Barker dog beds not only provides relief of these issues but also bring comfort and will hold up throughout their lifetime. As dogs age, having orthopedic support for those aches and pains is just the right thing to do. The issue today is finding a bed that provides for all these health problems and will last. Not all dog beds are made equal. Some are expensive while others are less expensive. Some have more memory foam while others have less. The main concern you consider is not the cost but how well it’s made and will it provide relief of those aches and pains dogs experience through aging. 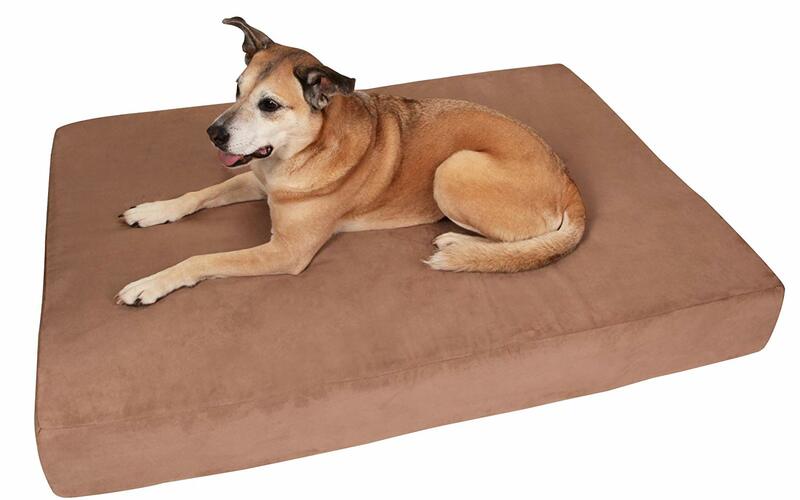 Most foam dog beds don’t last because of the type of foam being used in its production. If the memory foam is from China, this is a less inferior type of foam and will not hold up to the weight of your dog. Beds made with this type of foam tend to flatten out within six months or less. So, purchasing these beds are just a waste of money. Look for beds that offer good warranties and will replace the bed if the customer is not completely satisfied. Below is a review of the Big Barker beds which we highly recommend to pet parents of large dogs. Below we have provided the top 10 large dog breeds and their life expectancy. These are just averages as some will live longer and some less. If you are an owner of one of these dog breeds, it is important that you provide him the best possible bed for his comfort and health. Many of these dogs will be 100 lbs. or more when they are full grown. The Big Barker dog beds were designed by experts and are made in America using the best quality materials. The materials used are foam, fabric, zipper, and glue. Each one is detailed below. The foam used in the Big Barker beds are made with seven inches of memory foam. The bottom layer is made with 2 inches of H10 comfort foam. The middle layer is made with 3 inches of H45 support foam. The top layer is made with 2 inches of H10 comfort foam, that makes a total of 7 inches. This memory foam is guaranteed for 10 years to not lose more than 10% of its original shape or flatten out. If it does, it will be replaced free of charge. The foam used is American made and is certified by CertPUR-US to meet rigorous standards for emissions, content, durability, and performance. The headrest is made with 4 inches of contoured foam for the pet that likes to use a headrest when sleeping or resting. Note: The foam used in China is filled with toxic fillers which may cause health issues in pets. Also, the foam used in China has a habit of flattening out and falling apart over time. Be sure the bed selected with memory foam is made in the USA. The fabric used in making Big Barker beds must meet three tests: looks great in the home, machine washable, and holds up well against digging and nesting. The fabric used is also made for expensive couches and upholstery. The cover liner is machine washable. The fabric will not shrink when washed with cold water. This fabric, which is made from strong microfiber, scores 100,000 on the standard Wyzenbeek Abrasion test that measures a fabrics ability to withstand surface wear from rubbing. The Big Barker zippers are made completely in the USA’s oldest zipper factory. Each bed uses up to 150 inches of zipper that surrounds up to 75% of the bed. This allows you to remove the cover and replace it with ease. The glue used on Big Barker beds is totally American made with a water-based latex glue, and is OSHA compliant. This glue is sprayed on without any masks or filtration, which makes the product safe for pet and human environments. Dogs have accidents from time to time and below are the instructions on cleaning the liner cover and memory foam for Big Barker dog beds. The Big Barker bed covers are completely machine washable. They are water-resistant but not 100% waterproof. If any liquids should spill on the cover, the liquid will get through the microfiber cover if left sitting for a long period of time. It’s best to remove the spill as quickly as possible. Do this by washing using cold water and tumble dry. The microfiber on the cover does not shrink. The cover is easy to remove and replace. In the event that the foam should have an accident or a spill, soak the affected area with warm water and dish soap. Let is sit for 5 to 10 minutes. Press out the moisture as much as you can. Do not “wring out” the foam, because the foam is heavy and tears easily. Let it dry in place. This may take a couple of days to dry out completely. When it does, it should be as good as new. If not, repeat the above step. Large dog’s age quicker than small to medium size pets. During this time, dogs can develop muscle aches, joint pain, and arthritis. Dogs cannot speak to their owners. So, it’s up to the owners to spot or observe when their dog is suffering from joint pain. The Big Barker beds provide relief from joint pain dogs suffer as they age. The worst thing owners do is to use a bed that flattens out because it will not hold his weight. These beds do not help but can actually makes it worse. By not providing your pet with an orthopedic bed that stands up to their weight, can shorten their life and health over time. Most dogs can hide pain even when they have severe conditions. While some other dogs may limp or cry when they have these conditions. As pet parents you should be alert when you suspect your pet suffering from anything unusual. Orthopedic dog beds will help but you may also need to contact your vet for other suggestions on controlling his pain. We provide three suggestions on how to keep any pain symptoms from getting worse in your dog. They are diet, exercise and bedding. Each will be explained below. The diet plays an important role in controlling pain your dog may suffer as they age. The best thing you can do for large dog breed puppies is to feed them the right food to ease their rapid growth. Always monitor your pet’s food intake and weight. This also includes treats. You can add joint-supplements into his food to ease or slow arthritis progression. Dog’s that are overweight also plays a role in their pain. Try to monitor their weight. Feed them less or exercise them more to help control any possible weight gain. Feed him with the best possible quality and nutritious food you can afford. If your pet has been diagnosed with arthritis, you can keep him from putting on excess weight with exercise. Take 10-15 minute walks 5 days a week which help to lubricate his joints. Another suggestion is to limit his high-impact activities. You can try swimming or other low-impact activities. Your vet may have some helpful suggestions here. For dogs that do not have arthritis, exercise is always good for them to keep their weight under control. If your pet is suffering any pain, the best thing you can do is provide him with a great bed. This will have a lasting and permanent impact on your dog’s quality of life. Try finding a dog bed that provides at least two layers of foam. Big Barker dog beds do just that and more with three layers of foam. Big Barker caters to large dog breeds. The bed sizes are colors are explained in detail below. The large beds cater to Labrador Retrievers, Golden Retrievers, Boxers, Pit Bulls, Husky, and other dogs under 25” tall. The Extra Large beds cater to German Shepherd, Doberman, Newfoundland, and Mastiff, bigger than a Lab but smaller than a Great Dane. The Giant dog beds are specifically for Great Danes and Irish Wolfhound. When you bring home the Big Barker dog bed, be sure to place it in a location that has sufficient space. These beds are large and take up lots of room. Be sure that the bed is out of the way of heavy traffic areas. Dog’s like to have their own space and mark it as their territory. This is where they will feel safe and comfortable. Lots of information has been shared about the Big Barker beds. Remember, they come with a 10 year warranty. This is the only bed made for large dogs that have this length of guarantee to replace the bed for free if it loses more than 10% of its original shape. Yes, it is expensive, but affordable. If you buy this bed when your pet is a puppy, it should last for his entire lifetime and brings down the cost of the bed. You can shop for a Big Barker dog bed below. You will be taken to Amazon where you can select the color and size of bed with the order by clicking on the image of interest. Big Barker makes two types of beds with a pillow and without a pillow. Both types are provided below.